Mandoline the zucchini into thin slices (or use a potato peeler). If they seem bitter, sprinkle with salt, let sit for 5 minutes, rinse, drain, and blot away the excess moisture with a kitchen or paper towel. Put zucchinin in a bowl, add a good olive oil to taste, salt, and some lemon juice along with its zest, or vinegar if you prefer. Add cherry tomatoes cut in half if you have them and toss. Serve immediately, either on its own or as a bed for fish or shrimp. You need a mandoline to make very thin slices of zucchini for this salad — so please wear protective gear because you can hurt yourself badly if bare fingers get too near the blade. You can find cut-proof butchers gloves online in various price ranges and you only need a single glove (turn it inside out to make it left-handed). 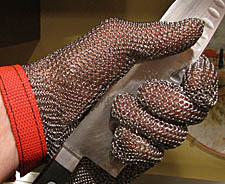 ALL professional chefs wear these gloves when using a mandolin and so should you!